- Land Drainage solutions for small and large gardens. We trade on the quality of our work and materials and offer the highest grade service to all customers. Our wealth of knowledge and experience sets us apart from all other landscapers. We cover all GU postcodes and surrounding areas of Camberley, Surrey. We offer free, no obligation quotes and do not pressure sell. All our team are DBS (CRB) checked and we do not sub contract our work out. We are honored to have been selected as Which Trusted trader of the month for May 2017. Installed Trellis fencing, removed old lawn, prepared new bed for roses. Laid Rolawn Medallion turf. Arrived when agreed, worked hard on the project. Very skilled at getting levels right. Left the site in good order. Back garden fencing and side gate fitted. Very impressed, have booked more work to be done. The work consisted of renewing fencing and cutting back overhanging trees. The men were helpful, and the work carried out quickly and efficiently. The site was left clean and tidy. Decommissioned and filled in a large outdoor swimming pool then turfed the whole area. Quote agreed was the price I paid. The team were all extremely polite and courteous. They arrived promptly each of the days. They behaved very professionally and left the whole working area very clean and tidy at the end. My neighbours were all as impressed as I was! Professional, tidy, clean, polite & hard working. Thank you for your review. Very kind words that sums up our aspirations. Came in and just got on with the job. They worked tidy & quickly. My turf looks fabulous. I would most definitely recommend & use again for other work. Many thanks for taking the time to review us. We love the difference a new lawn can make to a garden. The work carried out was extremely well done. All the rubbish including some rubble left behind by a previous set of workmen was cleaned away I would definitely recommend this company to anyone. Professional job, time keeping great, courteous workers who kept things clean & tidy. Really pleased with my new artificial lawn. Thank you for your review. We hope you are making good use of your artificial lawn and are enjoying the benefits of it being low maintenance. Replaced submersible land drainage pump following 20 years trouble free operation. 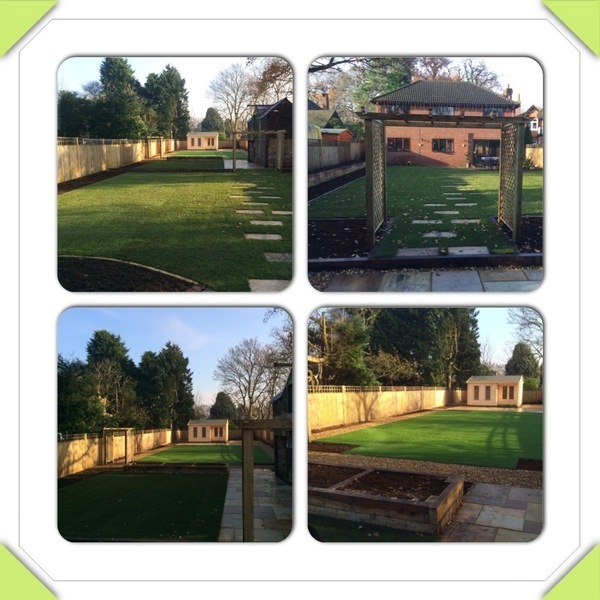 The original installation also by Southdown landscapes. Professional and knowledgeable team. Thank you so much for your feedback. We're glad we could be of assistance 20 years after our initial installation.